- Captain D's has Amazing Spider-Man 2 items in their kids meals. Thank you to the anonymous commenter who posted this on last month's round-up. I had not heard of Captain D's before! - Sonic has The Wizard of Oz toys that they are promoting in their Wacky Pack meals. - The Chick-fil-A site shows "Old School Fun" toys as the goodies in their Kid's Meals. The under 3 toy is a board book of Clifford the Big Red Dog. - The Wendy's web site has either added back in the toys or I've been missing the link all summer. In either case, the current promotion shown is five different Scooby-Doo toys. - Burger King has brought back their kids meal web site, and they are featuring Dolphin Tale 2 toys at the moment. Last month I had called a national number and asked about upcoming promotions, and this one was not on that list, so I am hoping that the rest of the list is still accurate: Rio 2 in October, and Tom and Jerry toys in December. 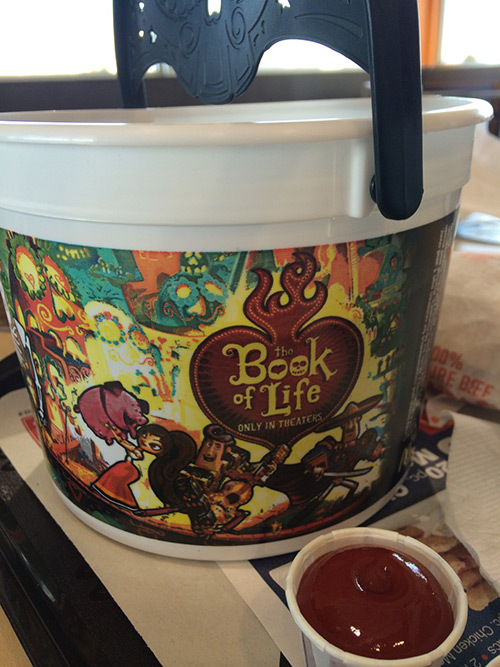 - Carl's Jr. and Hardee's both now have The BoxTrolls toys and activities. Starting in early November, the promotion changes to How to Train Your Dragon 2. - Subway Kids Meals have Star Wars: Rebels drawstring backpacks. There are six available. - Arby's has revamped their web site and it doesn't seem to show the toy anymore. In the comments in August, an anonymous commenter did my legwork for me and discovered that they had Mr. Potato Head toys, with Mr. Men and Little Miss toys coming in September/October. During the month of October, Wienerschnitzel gave out flashlights for Halloween. According to their DerKidsstuff website. However for December the website has changed and now you can not see what toy is being offered for their kids meals.